The Goods and Services Tax (GST) enabling bills will be placed in Parliament for approval this week itself, Minister of State for Finance Arjun Ram Meghwal said on Thursday. The four GST Bills -- Central Goods and Services Tax (CGST) Bill 2017, Integrated Goods and Services Tax (IGST) Bill 2017, Union Territory Goods and Services Tax Bill (UTGST) 2017, and Goods and Services Tax (Compensation to the States) Bill 2017 -- will be placed in Parliament either on Thursday or Friday, Meghwal said. He was speaking on the sidelines of the conference on 'Sustainable Infrastructure' orgnaised by the Institute of Cost Accountants of India (ICAI) here. The Union Cabinet approved the four GST-related Bills on March 20. The GST regime in India is in the final stages of culmination with the law most likely be implemented from July 1. 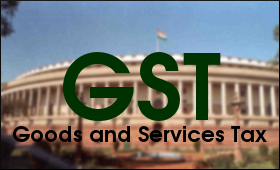 While the CGST Bill makes provisions for levy and collection of tax by the central government on intra-state supply of goods and services, the IGST Bill does it for inter-state supply. Similarly, the UTGST Bill is for the Union Territories like the Andaman and Nicobar Islands, the Lakshadweep, Daman and Diu, and Dadra and Nagar Haveli, which do not have their independent legislative assemblies. The Compensation Bill provides for compensation to the states for a period of five years for loss of revenue due to implementation of the Goods and Services Tax. Meanwhile, the State Goods and Services Tax (SGST) Bill 2017 will have to be approved by all the state legislative assemblies, including those of Delhi and Puducherry.